The madness only continues in the world of the UFC. UFC 230 once again has a new main event and it’s even more unexpected than the last. Just yesterday it was reported that a heavyweight title clash was in discussion between the likes of the champion Daniel Cormier and top contender Derrick Lewis. Well, this has now come to fruition as ESPN’s Brett Okamoto confirms via UFC President Dana White and Lewis himself that the bout is on for the November 3 date in Madison Square Garden. 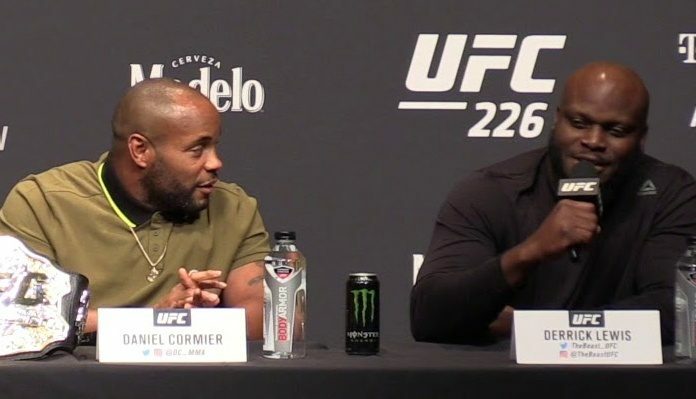 BREAKING: Per Dana White, "the fight is done" between Daniel Cormier and Derrick Lewis at UFC 230 on Nov. 3 in New York. Also confirmed directly with Daniel Cormier he's accepted the Derrick Lewis fight at UFC 230 on Nov. 3 in Madison Square Garden. BREAKING: Per Dana White, “the fight is done” between Daniel Cormier and Derrick Lewis at UFC 230 on Nov. 3 in New York. Also confirmed directly with Daniel Cormier he’s accepted the Derrick Lewis fight at UFC 230 on Nov. 3 in Madison Square Garden. Originally, UFC 230 went much longer than expected until it finally got its main event. And when it did, it was to the dissatisfaction of the majority of the MMA community as it was revealed to be the vacant flyweight title bout between Valentina Shevchenko and Sijara Eubanks (which has no been canceled). The UFC kept at it though and no brings us this out of nowhere heavyweight title showdown. It’s most surprising as Cormier was expected to be waiting for his fight with Brock Lesnar early in 2019 but perhaps the UFC made him an offer that he just couldn’t refuse. The same goes for Lewis who just won this past Saturday at UFC 229 by earning a very late third-round knockout over Alexander Volkov (the first loss of his UFC career).